And so it sat, forlorn, a mockery of its own inscription, “Lest We Forget”. 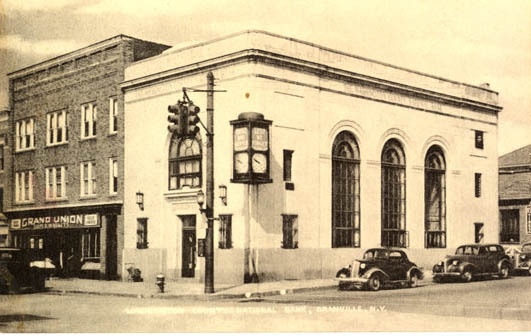 No one has mentioned when the original bank building was demolished and the clock mounted on a free standing pole, presumably sometime before it became inoperable. The clock makes a cameo appearance (at 3:14) in this video of Granville dating from the 1970’s when it was mounted on the side of a building across North Street from the former bank location. This is probably the period while the new bank building was being constructed, which is visible at the left at the very end of the video. For the last 25 years, John Freed has traveled past the broken 800-pound clock standing sentry in the middle of Granville. While it worked, the clock’s chimes could be heard all over town, summoning children back home to dinner. But then it simply stopped working and the chimes went away. As each year went by he became angrier that the clock, dedicated in 1943 to honor Granville’s World War II veterans, had ceased to function. 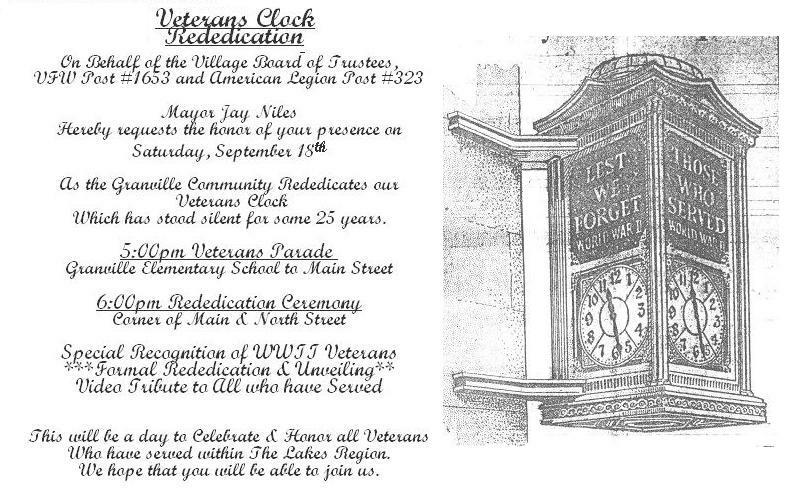 It took John Freed four months to restore the World War II commemorative clock that stood broken in the center of town for the last 25 years. Angry that a clock dedicated to veterans ceased to work, Freed, the owner of a computer software firm and music instrument repair business, decided to fix the clock for the veterans on his own and free of charge. But when he took the clock down from its pole on the front lawn of TD Bank back in April, donations came pouring in. So, if you can possibly make it, the trip to Granville this Saturday will be worth your while to see a historic artifact returned to its former glory and the commitment to the veterans it honored, restored. Matthew Rice’s blog, where he transcribed the original Granville Sentinel news stories, is here.